Underpinned by both technology and economic disruptions, cloud computing is a sustainable, long-term IT paradigm that will fundamentally change the way business customers and individual users engage with technology providers. At the moment, most customers are confused by the overused “cloud” term and are concerned over the risks of cloud computing. In fact, security is the number one impediment to cloud adoption today. Due to these security concerns, many organizations avoid leveraging cloud resources where highly sensitive data is involved, where rigorous compliance requirements apply, or for business critical applications. 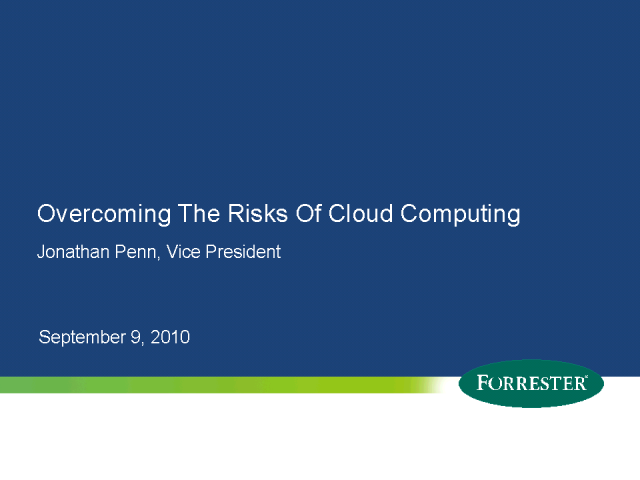 Yet business proceeds full speed ahead while the risks of cloud remain real and unmet. This session will explore the broad scope of concerns related to security of the cloud and provide security and risk guidelines for cloud computing. As to how adopting organization should organize and address concerns over data security, compliance, auditability, and other specific features needed to bring assurance to cloud adoption.